All photos taken last Thursday. Seven more below. . .
1. The Kid and his five girls enjoying some fresh green grass. (After sheep working Sunday this morning, breeding season ended and both rams were put back in their pen together). 2. Bear gets some lovin' from Mr. Midnight. 3. 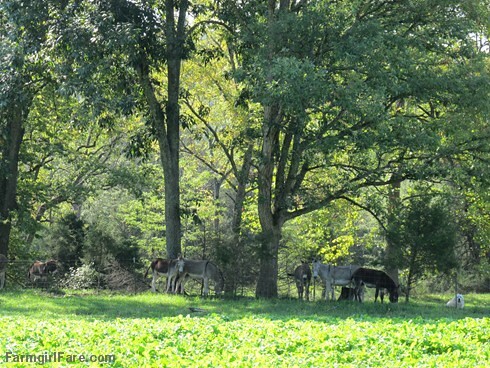 Donkeys eyeing the sheep's turnip patch. 5. Catching up on washing socks (after waiting until the last minute). 6. Beautiful baby autumn greens are in our salad bowls every night. 7. Dwarf kale, purple kohlrabi, Blue Curled Scotch kale, Parris Island cos lettuce, and New Red Fire lettuce direct seeded in a (falling apart) 4'x8' raised bed in late August. 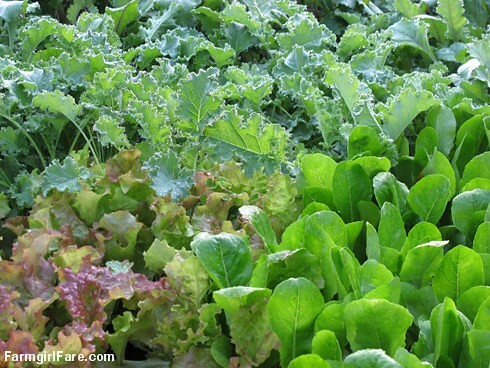 Learn how to grow your own gourmet lettuce from seed here. It's easier than you think! 8. Heading out to rake some hay! © FarmgirlFare.com, where it's been 20+ degrees below normal during the day, and we had our first frost this morning. Hello autumn, you gorgeous thing, you. Wow, it almost looks like SPRING there! So glad you are getting some green grass AND hay to help ease the feed situation there. Wonderful to see that green grass again! Love that green! Gorgeous bed of greens too. Note to self, plant fall greens next August. Susan, you will crack up. I have a postit on the wall of my office that says, "Sept 11, plant fall greens garden, per Susan." Isn't that funny? Unfortunately, I didn't see it until today, argh! Enjoy the fruits of your labor. Thanks for sharing those gorgeous photos! Excellent idea!!! Thanks dear girl. I do have seeds that I will put in today! You rock, Kiddo! Beautiful photos--a nice visual respite from gritty East Los Angeles. Love your blogs. 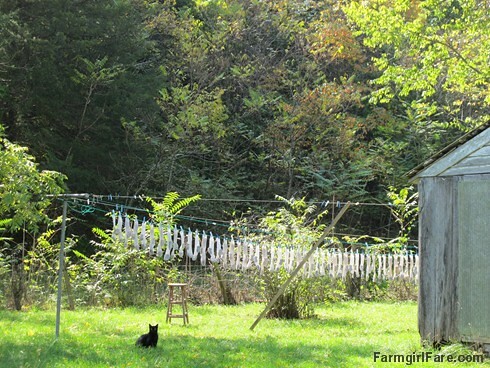 Ho wonderful to see all of that beautiful green at your farm :) And I'm glad to know that I'm not the only one who waits until we're on the LAST pair of socks. Happy fall! Oh hallelujah! 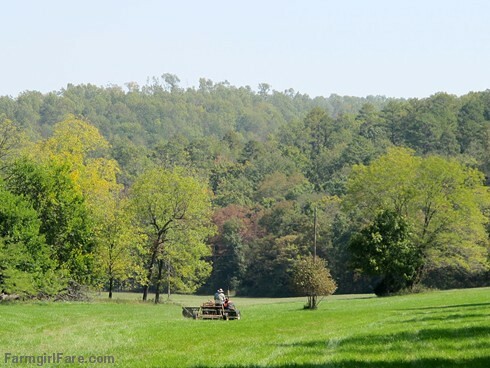 To see Joe out on the tractor in a green grassy field does my heart good. Let's hear it for fall! It's always somebody trying to ruin or eat our greens, isn't it? :) We have a lot of rabbits, but Mr. Midnight is an ace rabbit catcher. What I have trouble with when direct seeding are the sneaky hens who squeeze through the once section of garden fence that isn't totally chicken proof and scratch up newly planted beds. Or Mr. 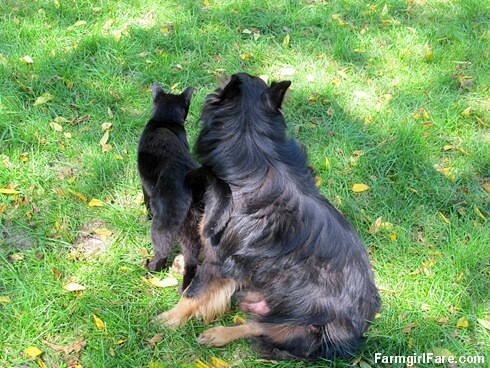 Midnight, while in there hunting rabbits, scratches them up, lol. Then there's the mole who made tunnels all across the bed adjacent to that one. What I do is cover the beds with floating row cover (I love this stuff) as soon as I seed and water them. And I cover them up at night. The only thing you need to be careful of is frying the plants when the weather is really warm and humid. 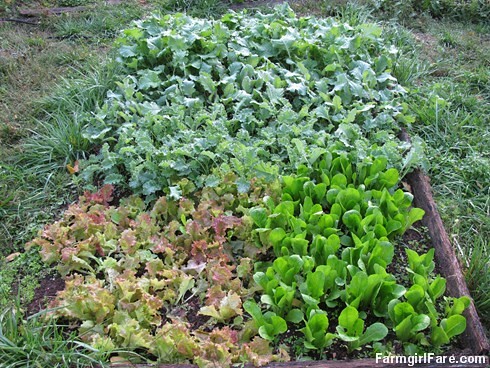 I learned that the hard way last spring when I tried to protect a whole bed full of gorgeous lettuce from the blazing sun and heat (which makes lettuce bitter), and ended up turning the whole thing to mush instead. Here in Missouri, late summer planting for fall usually works out well. This morning it was 24 degrees and I left that bed uncovered. Everything was frozen solid first thing this morning, but after the sun hit it you'd never know. If I'd covered the bed with row cover last night, it would have been less stressed and in even better shape. Nice crop of socks there. Love seeing the green for a change. We (in the Dakotas) went straight from brown grass to brown dirt. On July 1st I gave up the ghost and quit watering and we have a nice crop of dead grass and dust to show for it. But the ground was like a sponge and it was pointless to keep watering because it was just baked out during the day. But just remember, everyone, this was only one year. We may have two or three more years just like it, which is really still mild compared to the dirty thirties. Hope and pray we don't go THERE ever again. (The dirty thirties was essentially a man-made disaster). The socks on the line just might be my favorite photo! Thanks for sharing all of them with us! Back in August, when we had no idea if it would ever start raining again and the fields were still totally burned up, we broke down and bought some really expensive alfalfa hay to feed the sheep and donkeys this winter. If we were really frugal with it (and supplemented with extra grain, the price of which is also going through the roof), it would probably have been enough to last until April or May, which is when the fields are usually grown up enough to start grazing again. So beautiful! Thanks, as always, for sharing the beautiful part of the world you live in. So glad you're feeling better, the heat is gone, your grass is green, and you're getting some hay. Hopefully winter will be good to everyone. Enjoying the photos (especially Moonrise over the Hayfield from your last post) and I always enjoy seeing your critters. Sigh. 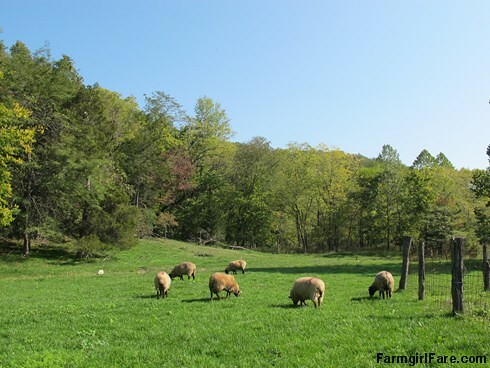 Been looking for a good farm blog to live vicariously through. I do garden and have chickens, but your place makes my morning.